Bolognese sauce (ragù alla bolognese in Italian, also known by its French name sauce bolognaise) is a meat-based sauce for pasta originating in Bologna, Italy. Bolognese sauce is sometimes taken to be a tomato sauce, but authentic recipes have only a small amount of tomato. Left: Tagliatelle with bolognese sauce. 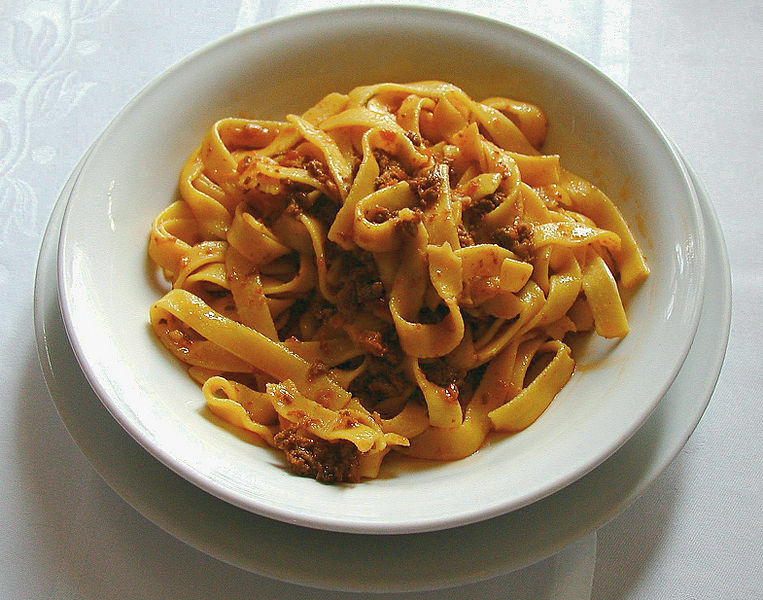 The people of Bologna traditionally serve their famous ragù with freshly made tagliatelle (tagliatelle alla bolognese) and their traditionally green lasagne. Less traditionally, the sauce is served with maccheroni or other durum wheat short pasta. The traditional recipe confines the ingredients to beef, pancetta, onions, carrots, celery, tomato paste, meat broth, red wine, and (optionally) milk or cream. However, different recipes, even in the Bolognese tradition, make use of chopped pork or pork sausage, while chicken or goose liver may be added along with the beef or veal for special occasions, and today many use both butter and olive oil for cooking the Soffritto of small amounts of celery, carrot and onion. Prosciutto, mortadella, or porcini fresh mushrooms when in season may be added to the ragù to further enrich the sauce. Milk is frequently used in the early stages of cooking to render the meat flavors more "delicate" but cream is very rare in the everyday recipe and only a very little would be used. The longer Ragù alla Bolognese cooks the better; a 5- or 6-hour simmer is not unusual.